Left to right, Eric Hassid, M.D. ; Andrew Brooks, M.D. ; and Angela Lim, D.O. The Vacaville Center for Specialty Care has opened in VacaValley Health Plaza on the campus of NorthBay VacaValley Hospital. 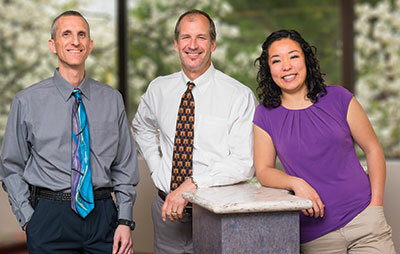 The center has a focus on musculoskeletal care and includes three physicians: Dr. Eric Hassid, M.D., Andrew Brooks, M.D., and Dr. Angela Lim, D.O. Dr. Hassid is a specialist in functional medicine, which focuses on the factors that are the underlying causes of many diseases. Some of those factors include diet, weight issues, inactivity and environmental exposures, such as smoking. He helps patients maximize their core strengths by identifying their barriers to good health. Orthopedic surgeon Andrew Brooks is the medical director of NorthBay’s Orthopedic Program. He is an expert on joint replacement, including the new partial knee replacement techniques. Dr. Lim is an expert in Osteopathic Manipulative Medicine or OMM. OMM is a hands-on approach to pain, which takes a patient’s musculoskeletal, circulatory, lymphatic and nervous system into account. Dr. Lim uses her hands to move muscles and joints, using techniques that include stretching, resistance and pressure. Plans call for a rheumatologist to join the practice in the fall. The Vacaville Center for Specialty Care is located in Suite 200 of VacaValley Health Plaza, 1010 Nut Tree Road. This was a former location of the Center for Primary Care. “The Center for Specialty Care complements other specialty services offered there,” explains Stephanie Tarter, senior director of ambulatory services for NorthBay Healthcare. On the first floor is the Center for Diabetes & Endocrinology as well as the NorthBay Center for Wound Care and infectious disease specialist Greg Warner, D.O., and Maqbool Ahmed, M.D., a specialist in pulmonary-critical care.